The 15th anniversary of Munchkin rockets to new heights in March! 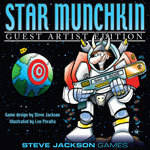 Go where no Munchkin has gone before with Star Munchkin Guest Artist Edition! All the intergalactic heroes, baddies, and weapons are being beamed up by our friend, artist Len Peralta. Len has worked with us before on Munchkin: The Guild, in addition to his Ten State comic and Geek a Week trading cards. Check out Len's awesome speed drawing of the Star Munchkin Guest Artist Edition cover! He's not only fast, he's incredibly talented! Ask your Friendly Local Game Store about preorders!